Al-Falih has gained a great deal of credibility over the last three-quarters of a year by outlining Saudi's next move in terms of exports, then following through on it. We should therefore take heed from his latest comments. Al-Falih also signaled that the kingdom will continue to keep its crude exports in check next month, holding below 7 million barrels per day. This is no surprise, and will be their stance until at least the Saudi Aramco IPO. We can see from our ClipperData that a good deal of OPEC's success in lowering OECD inventories has been by directing exports to emerging markets instead. We've highlighted before that Saudi Arabia took about 100 million barrels off the global market last year via lower exports. 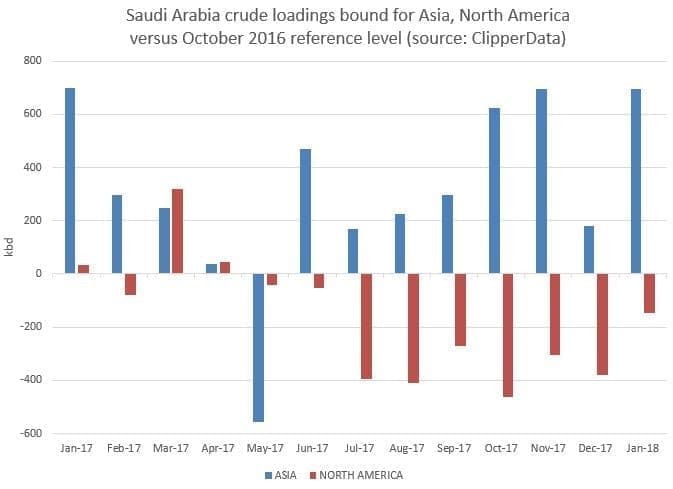 The chart below highlights the change in emphasis from Saudi Arabia around June, when it started increasingly favoring sending crude to Asia, at the expense of North America. Export loadings bound for Asia in the last seven months of 2017 were up 380,000 bpd versus the October 2016 reference level, versus a drop of 325,000 bpd heading to North America. We have also seen another trend emerge in the last year in conjunction with the oil production cut deal: that of higher Saudi Arabian middle distillate exports. We first highlighted in March of last year that Saudi Arabia could be supplementing its lost revenues from the OPEC oil production cut deal by exporting more products. 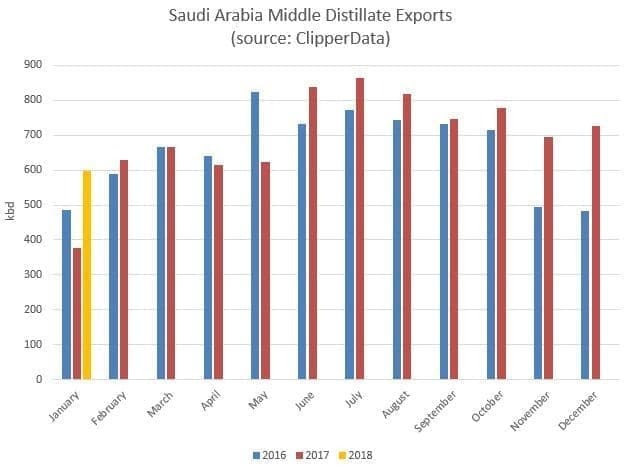 We can see from our ClipperData below that Saudi middle distillate exports outpaced year-ago levels in each of the last seven months of last year, by an average of 110,000 bpd over the period. This year has also started off strongly, well above January 2017's level. While higher refining capacity in the kingdom could explain away this increase - as could higher demand (as we discussed earlier this week) - it is interesting that the increase in middle distillate exports last June coincided with change in strategy for crude exports. The Saudi Oil Minister, Mr Khalid Al Falih is a very clever man. He has been reading the global oil market very carefully. The first thing he did when he became oil minister of Saudi Arabia was to reverse the discredited strategy of his predecessor, Mr Ali Al Nuaimi, of flooding the global oil market in defence of Saudi oil market share and spearhead with Russia the OPEC/non-OPEC production cut agreement. The agreement is credited with the re-balancing of the global oil market and the recent surge in oil prices. de-accelerating a build in US oil inventories thus supporting oil prices. But there is more to the new strategy. On the 26th of March this year, China will launch a crude oil futures contract on the Shanghai Energy Exchange (INE) denominated in petro-yuan, potentially creating the most important Asian oil benchmark and allowing oil exporters to bypass petrodollar-denominated benchmarks by trading in petro-yuan. And in order for the China’s crude oil futures to succeed, China must have the participation of the world’s two biggest oil producers and exporters, namely Russia and Saudi Arabia, who between them account for 26% of global oil production and 25% of oil exports. Russia is already on board. China is now trying to persuade Saudi Arabia to start accepting the petro-yuan for its crude oil. If Riyadh wants to avoid losing more ground to Russia in the Chinese market, it may have to agree to petro-yuan sales. It is possible that the new Saudi export strategy might be preparing the way for accepting the petro-yuan.